Glenn McMahon, a 56 year-old man from New Jersey, thought his bariatric surgery would only require an overnight stay. Following surgery, however, Glenn developed pneumonia and a severe form of the acute respiratory distress syndrome. He ended up in the intensive care unit fighting for his life. Despite maximal support with a mechanical ventilator, Glenn’s oxygen level was dangerously low from his severe pneumonia. His physician recognized that Glenn’s only chance of survival depended on receiving ECMO, a device that provides oxygen to and removes carbon dioxide from the blood, thereby supporting the brain and vital organs when the lungs are too sick to do so. Glenn’s physician contacted the NewYork-Presbyterian Hospital/Columbia University Irving Medical Center (NYP/Columbia) mobile ECMO transport team, which immediately traveled to New Jersey, placed Glenn on ECMO, and safely transferred him to NYP/Columbia’s Medical Intensive Care Unit (MICU). “There was no question after talking to [his physician] that Columbia was where we wanted to be,” said Kathy McMahon, Glenn’s wife, who was a pulmonary nurse for 35 years. In NYP/Columbia’s MICU, Glenn was supported with ECMO for 22 days. His body received the oxygen it needed while his lungs recovered. Once he sufficiently improved, the ECMO machine was removed and Glenn continued his recovery, before regaining enough physical strength to ultimately be discharged home. 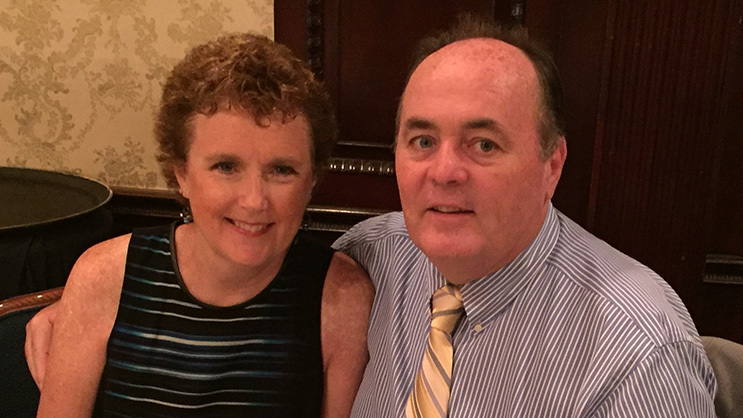 Glenn and Kathy remain firmly connected to the NYP/Columbia ECMO Program, and hope to aid current and future ECMO patients and their families. “I can’t say enough about the staff. There aren’t words to describe how grateful we both are… They looked out for my needs and [Glenn’s] tremendous medical needs. They still reach out about how Glenn is, how I am. I feel like I became a part of the Columbia MICU family,” said Kathy.